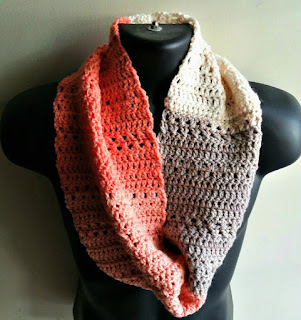 Here is a scarf I created using the leftover Caron Cake yarn I used for the River Rock Slouch. This scarf can wrap once if you prefer more of a cowl. While I made it to go with Caron Cakes yarn, just follow the gauge to use your favorite yarn. The scarf is made in rows then sewn together for a circle scarf. Don't forget to add to your Ravelry queue! Row 6 2 dc in each space left from previous row, ending with 2 dc in last stitch. Ch 3, turn. Row 9 Skip the next stitch (since ch 3 counts as a dc) dc in next stitch, then dc back in skipped stitch. Repeat to end. Ch 3, turn. Row 10 Skip the next stitch, dc in next stitch, then dc back in skipped stitch. Repeat to end. Ch 3, turn. Row 15 - 16 Repeat rows 5 - 6. Row 19 - 20 Repeat rows 9 - 10. Rows 21 - 70 repeat rows 5 - 14 ending on CDC on row 70. Without twisting, whip stitch, sc or sew ends together. Weave in ends and fasten off.